Last week, leading up to the progressive tidal wave that swept Boston, education activist Kristin Johnson became concerned about the lack of polling in several key local races. In search of clues, we began poring over contribution reports in the MA campaign finance database, and she (and then we) began geolocating these contributions on maps. Per a critically important piece published yesterday on her blog, it appears concentration density of a candidate's in-district political contributions, and whether the density spreads evenly throughout the district, predict electoral outcomes more accurately than polling. In the MA-7 congressional race, for example, polling done by MassINC and WBUR in February and August predicted 12- and 13-point leads for incumbent Michael Capuano, respectively -- he lost by 28 points. In the days leading up to that election, our review of FEC contribution data showed that though Capuano raised nearly double Pressley in the final reporting quarter, Pressley received 500 more contributions than him. More significantly, the contribution map that Kristin created above shows Pressley had a denser, more evenly distributed concentration of in-district contributions -- and this appears to have predicted her 64% landslide win with much more accuracy than the two polls that whiffed. Contribution density and spread also appears to have successfully predicted the outcome in the Suffolk County District Attorney race, above, in which Rachael Rollins bested a field of five with a whopping 40% of the vote. It also predicted the downfall of the House Ways and Means Chairman, Jeffrey Sanchez, in the 15th Suffolk race, and in other key local races outlined in much greater detail in Kristin's post. Which left us wondering: is this a phenomenon that is limited to Boston, or is it something that could apply more broadly? This Thursday, Sep. 13, incumbents in New York State, the Bay State's neighbor to the west and home to its baseball nemesis, the Yankees, will soon find out. The above image, from a map created by Nasrene Haj, geolocates campaign contributions to two candidates running for Senate District 20 (a district whose boundaries rival the most gerrymandered in the nation). From Jan 1, 2017 to current reporting as of Sep. 8, incumbent Jesse Hamilton has received 674 contributions totaling $569,362. Between October 25, 2017, when Myrie officially announced his run, to current reporting as of Sep. 8, Myrie received 3,362 contributions for a total of $355,427. A quick glance of the above fundraising chart shows that Hamilton, like Capuano did, enjoys a hefty fundraising advantage. However, after geolocating the candidates' contributions it quickly becomes clear the bulk of Hamilton's contributions -- via PAC money from Albany and IDC contributions ordered returned due to questions surrounding their legality -- come from upstate ZIPs outside the district. In reality, as shown in the above chart, Hamilton's contributions from ZIPs inside Brooklyn amount to less than a third of Myrie's. Myrie, as shown by the fundraising graphic above and the map two images above, has a much higher in-district contribution density than Hamilton, and like Pressley, it spreads much more evenly throughout the district. More tellingly, and concerning for Hamilton, Myrie received 1,584 contributions from Brooklyn ZIPs compared to Hamilton's 212 -- nearly seven and a half times more. This means that if the lessons of Boston hold true in New York Thursday -- as in Boston it will likely hinge upon solid voter turnout -- BOE data predict Zellnor Myrie wins big. Jesse Hamilton isn't the only incumbent who should be nervous. A map of Board of Elections data in Senate District 18 above, also by Nasrene Haj, reveals that challenger Julia Salazar has a massive advantage in both total contributions, and concentration density spread evenly throughout more of the district, than incumbent Martin Dilan. This race may be a bit trickier to forecast than Senate 20, on account of relentless attacks in the media against Salazar, and a late-breaking news story reporting Dilan has failed to report contributions since 2016, but if voter turnout levels are high, the BOE contribution data suggest Salazar has a commanding lead over Dilan and should win easily. One of the most encouraging takeaways from the Boston races, such as the MA-7 race discussed above, was that voters appeared to reject incumbents who had raised more total money from smaller numbers of wealthy contributors. If this phenomenon holds in New York Thursday, additional progressive challengers benefit, including Jessica Ramos in State Senate District 13 and Alessandra Biaggi in State Senate 34. As the above graphics show, Biaggi and Ramos (along with both Myrie and Salazar) have received exponentially higher numbers of smaller contributions than the incumbents they are challenging. Additionally, the average contribution size made to the incumbents is significantly higher, which in multiple Massachusetts races, such as the 15th Suffolk, voters completely rejected (challenger and winner Nika Elugardo spent $22 per vote compared to incumbent Jeffrey Sanchez's $67 per vote). 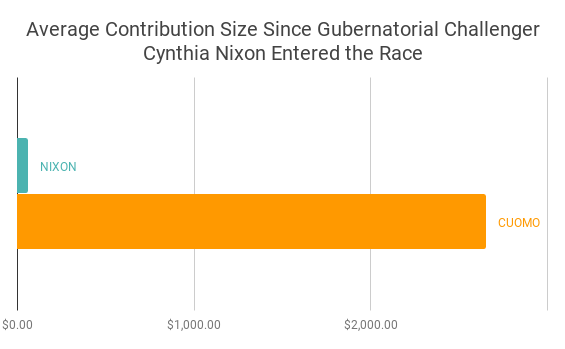 There is perhaps no better illustration of this disparity than the above graphic of contribution totals in the gubernatorial race. 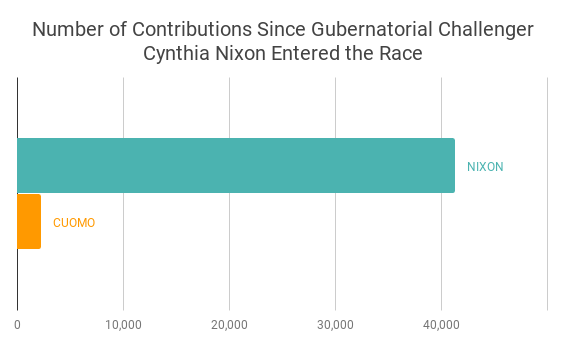 Cynthia Nixon, since announcing she was challenging incumbent Andrew Cuomo, has received 41,244 contributions to Cuomo's 2,228 -- nearly 20x more. Perhaps more tellingly, her average contribution is $59.97 compared to Cuomo's $2,650. Though she has far too many contributions to map in time for Thursday, chances are, if the majority of these contributions are concentrated evenly throughout the district, there is a good chance her BOE numbers will translate into a very good showing at the polls. Again, and this cannot be emphasized enough, all of the above is contingent upon high levels of voter turnout, so if you want to see progressive candidates sweep New York as they did Boston last week, please do everything in your power to get out the vote on Thursday.